A great thing about Gary Clarke’s new dance show COAL is that it involves real people from South Yorkshire pit communities, dancing with a professional cast. The show is based on the lives of miners and their families and every venue where it is touring features women from local pit communities. 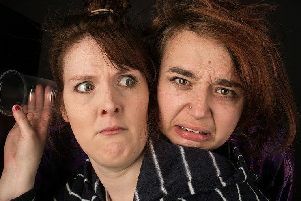 In Doncaster two sisters and their sister-in-law who were the first to appear in the show’s trial run at Cast last year. Kelly Leighton, aged 37, who lives in Balby, her younger sister Kim, who lives in Edlington, and their sister-in-law Emma Telford-Leighton, aged 32, from Edlington are all excited to be back on stage again in Doncaster this week. Kelly and Kim work together in Kelly’s cleaning company and Emma is a nursing assistant at Tickhill Road Hospital, so showbusiness is completely new to them. They play women who actively supported their men during the miners’ strike. They became involved when Kelly’s father-in-law Frank Arrowsmith, an ex-miner, volunteered to talk about his experiences as part of the research for the show. Kelly said: “My father-in-law gets us involved in all sorts of different projects including the Edlington pit memorial. “He saw a call-out for COAL and did a day with Gary and TC Howard. Then he told us ‘I’ve got this wonderful thing for you to come and do’. “We rocked up on the Saturday, when they told us what it was all about and we all ended up having this really deep conversation about our lives. Kim said: “As soon as we all found out what it was about, we were quite shocked. We couldn’t believe we were going to do this. Emma’s clearest memories are of 1992, when her dad Russell Telford shot to fame during the pit closures crisis. She said: “We were on the news and everything, Arthur Scargill came round to our house. We were quite a famous family, we lived in Wheatley at the time. That’s not always a good thing.” Russell went to jail. Kelly and Kim remember their mum supporting their dad on the picket lines and going to rallies. Kelly said: “She worked five jobs during the strike as there were four of us and they had a mortgage to pay.